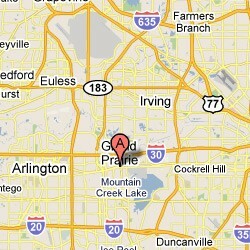 Grand Prairie is a suburb of Dallas that offers a family fun, friendly neighbors and a smart place to work and live. Conveniently located between Highway I-30, I-20, and 360, Grand Prairie is a rapidly growing with more than 166,000 residents. This city is unparalleled in attractions and events. Grand Prairie is home to a Class 1 Racetrack that features live horse races, a large performance hall, a minor league baseball team and a premium shopping outlet. Also, Grand Prairie is home to a golf course and a municipal airport, lakeside picnicking and cabins, as well as an annual drive through holiday light show. Grand Prairie uniquely provides an array of entertainment and activities for everyone. A newly built senior center features a movie theater, banquet halls, an indoor swimming pool, basketball courts and a fully equipped gym perfect for each and every senior citizen that resides here. This is a city that is only going to expand and grow its features even more. The proximity to the AT&T Stadium as well as Six Flags and Hurricane Harbor speak to Grand Prairies wide variety of fantastic high thrill levels of adventures for the whole family. There is not only grand entertainment here, but also outstanding dining opportunities, too, from an all American burger joint to Mongolian grills and noodle bars. Grand Prairie provides a unique array of opportunities for the whole family. Grand Prairie ISD is a district that has a mission to strive to insure success, through engaging learning experiences, collaborative leadership, and focusing maximizing all students’ achievement. Spread through 43 campuses, GPISD is vigorously pursuing success from the classrooms all the way to the administration building. Anyone can feel confident in their child attending a Grand Prairie school.